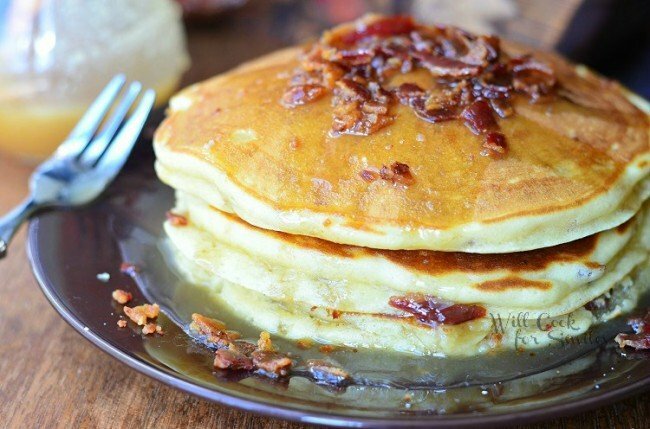 Maple Bacon Pancakes is a perfect breakfast for every bacon lover. 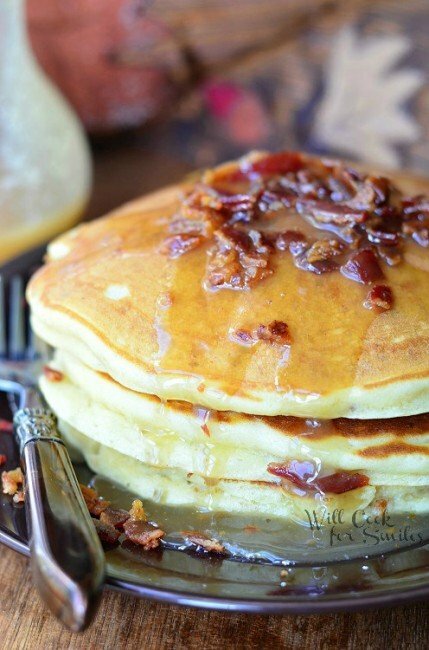 Fluffy buttermilk bacon pancakes made with pure maple syrup and crispy bacon inside and out. 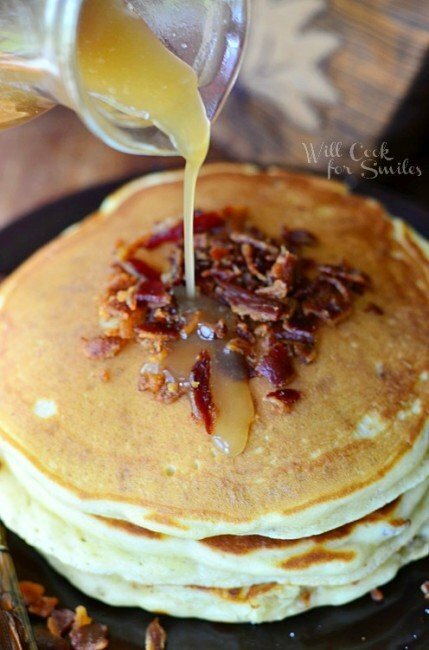 These pancakes are topped with more crispy bacon on top and some creamy maple sauce! My husband LOVES bacon. If he could, he would add bacon to everything he eats. A couple of years ago, I even made him “flowers” made out of bacon. So anytime I make anything featuring bacon, he is all over it. Pancakes just happen to be my boys’ favorite breakfast too. These scrumptious and fluffy pancakes that are cooked with crispy bacon and pure maple syrup inside and more bacon and maple sauce on top! This breakfast was like heaven for everyone who enjoys bacon, pancakes, and of course, bacon pancakes. I would have never thought about putting maple syrup and bacon together until a few years ago. I was working at a restaurant and a lady ordered bacon with her breakfast. I saw her put maple syrup on her bacon and I just had to ask her about it. She looked at me like I was crazy for asking her and that everyone does that. “Ha… nope, never seen that before.” Although, I was intrigued and had to try it. 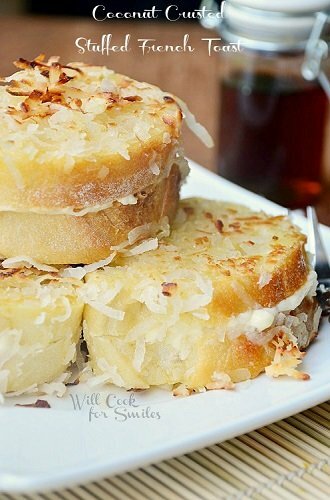 Turns out it’s an amazing sweet and salty combination! 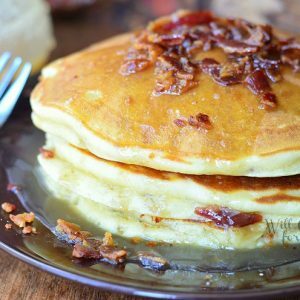 Soft and fluffy bacon pancakes made with maple syrup inside and topped with more bacon and creamy maple syrup. Cook bacon and make sure to SAVE some bacon grease when you cook your bacon. 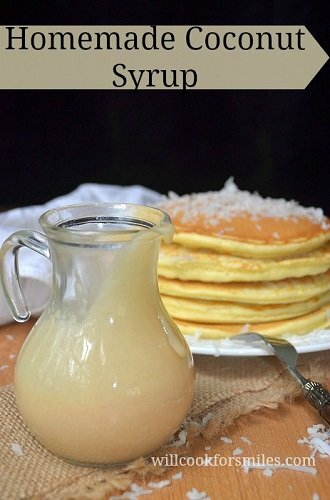 Pancakes: Whisk you wet pancake ingredients until combined. Whisk in your dry ingredients and crumbled bacon. Let the batter stand for about 15 minutes. This is a good time to preheat your cooking pan and make the sauce. Cook the pancakes, in your preheated pan, for about a minute or two on each side. Check the pancakes by pressing lightly in the center, if its firm the pancakes are done. Sauce: Heat up the pure maple syrup first. Whisk in the powdered sugar and then the heavy cream. Serve the pancakes with some crispy bacon on top and the maple sauce poured over it. Originally posted on Will Cook For Smiles on October 30, 2013. 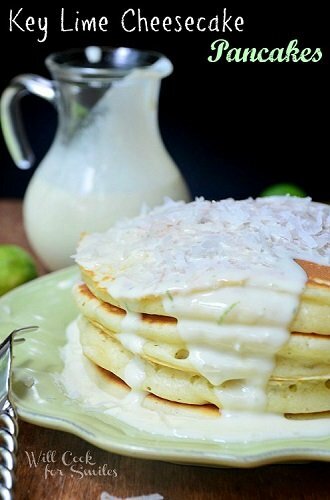 These pancakes look amazing Lyuba! I want some right now 🙂 Pinned! I wish I could hook you up! Thanks, Trish! 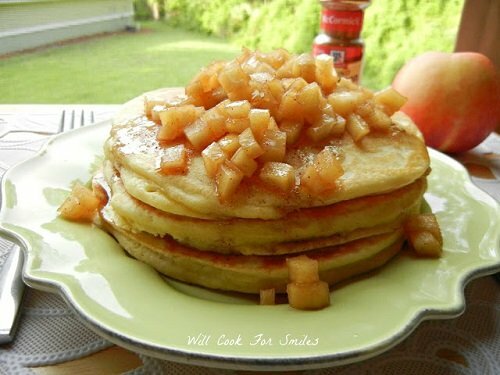 Oh my how I would just love waking up to these pancakes! Thank you so much for sharing with Full Plate Thursday and hope you have a great weekend! 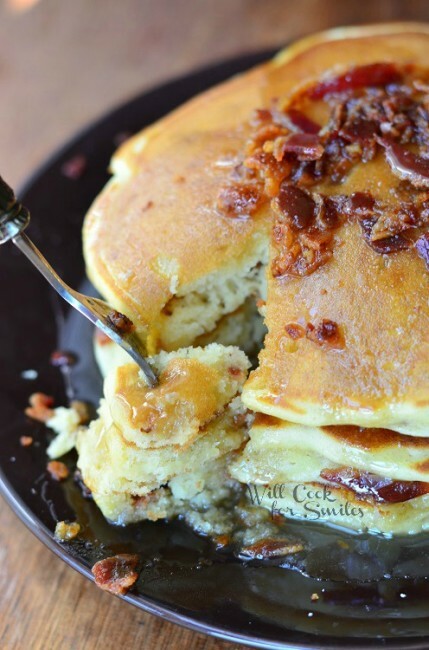 I love how bacon can go with just about anything… but these pancakes rock! 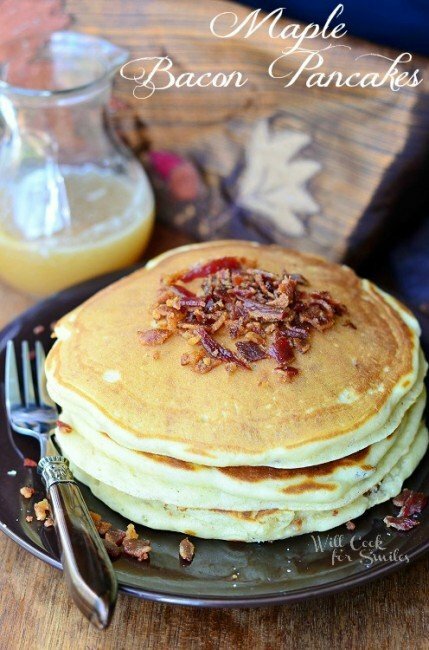 I have to say pancakes…with bacon is my favorite every weekend. I’m going to make this on Sunday! It sure does, doesn’t it?! Thank you, Gloria!! YES!!! I could live on these pancakes. 🙂 Hehe, Thank you, Michael! MMMMM I would love these too! Combining two of the best breakfast flavors ever! Oh my! These are my kind of pancakes! The homemade syrup looks fabulous. Thank you so much, Danelle! WOW! These look and sound incredible!! My stomach is grumbling just looking at the photos! Thanks for sharing! Holy bacon! These look SO yummy! We seriously eat a ton of bacon around here plus we love pancakes so this is a perfect breakfast. Thanks for sharing at Saturday Night Fever, Lyuba!